I have no problem getting up early, even at 2:30 am like this morning, but I know I am going to pay for it later, especially after a busy Saturday, the pinnacle of the week. I find trying to catch up on broken sleep a bit futile and frankly unpleasant, where early reality tangles up with dreams in an unsettling fashion. I do lie down though; back home at 7am, enjoying my own Dawn Chorus… This time I left the bay windows open, one eye closed, drool on the pillow, the other getting amused by a Red Tailed Bumblebee stuck on the wrong side of the glass. I know I should get up to help… But the arms of Morpheus are holding me firm under the covers… ( not the guy from the Matrix, rather the Goddess of sleep… Just saying!). 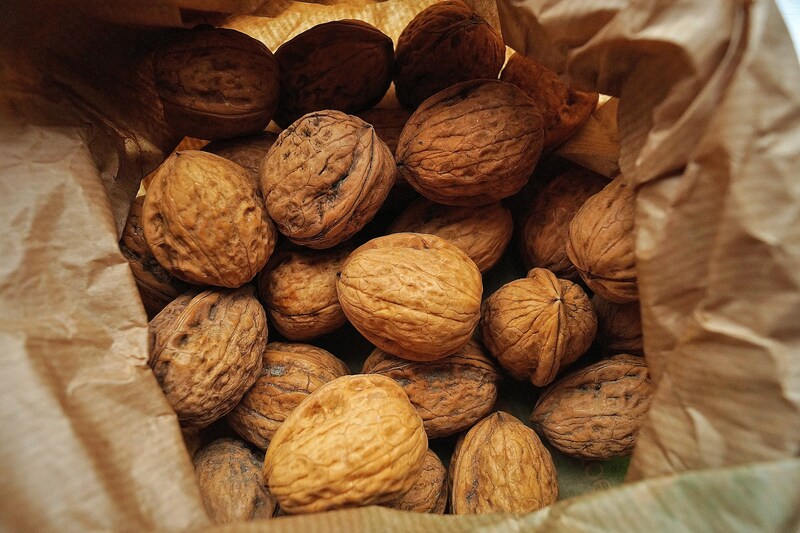 I also bought some French walnuts and some organic spelt berries from Dunany, just a little further North, In Co. Louth, from where we were this morning… A staple cereal of our ancient Celtic ancestors we have in common. 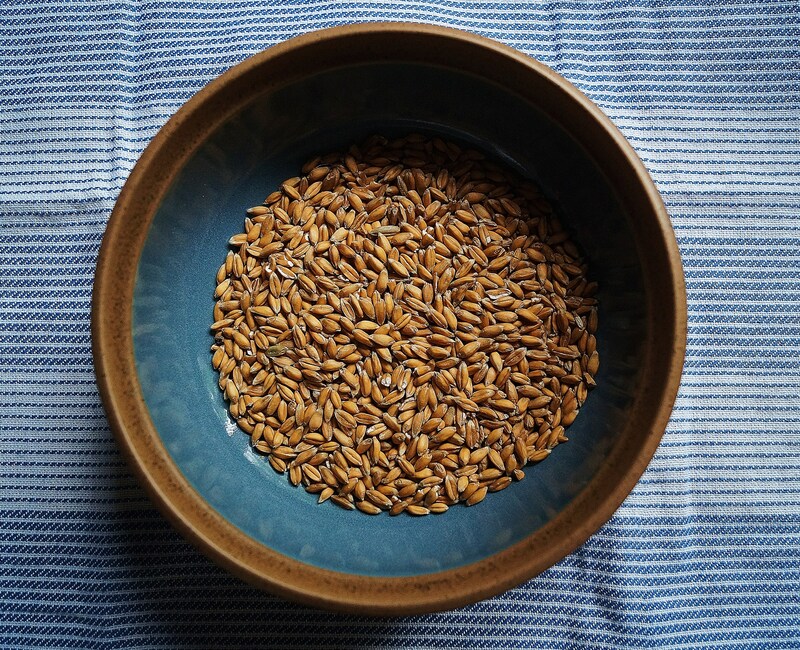 I dry roasted them to sprinkle on the salad at the end… This recipe is writing itself! Spelt berries, used since 5000 BC! 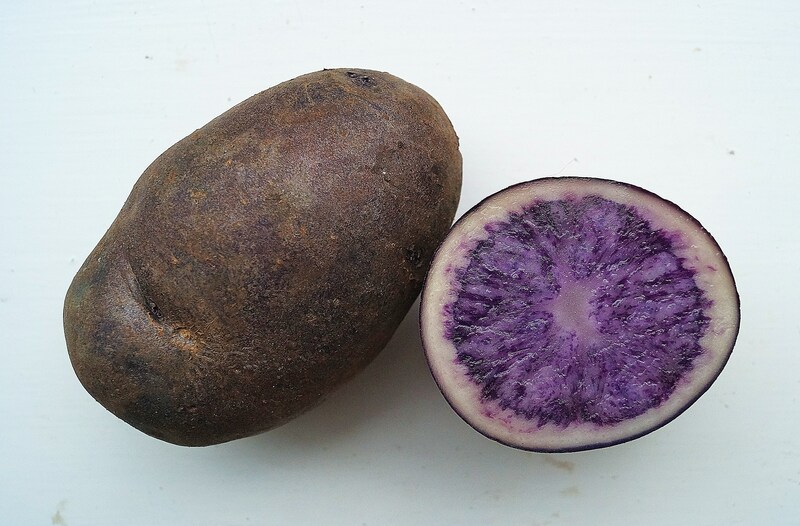 But my star ingredient will have to be the purple potatoes that I got. I have seen them before but never did anything with them. I have eaten them as crisps once… I just wanted to use them boiled, as an upgraded version of a potato salad if you wish, but the seduction came from the contrast it would offer on the plate. 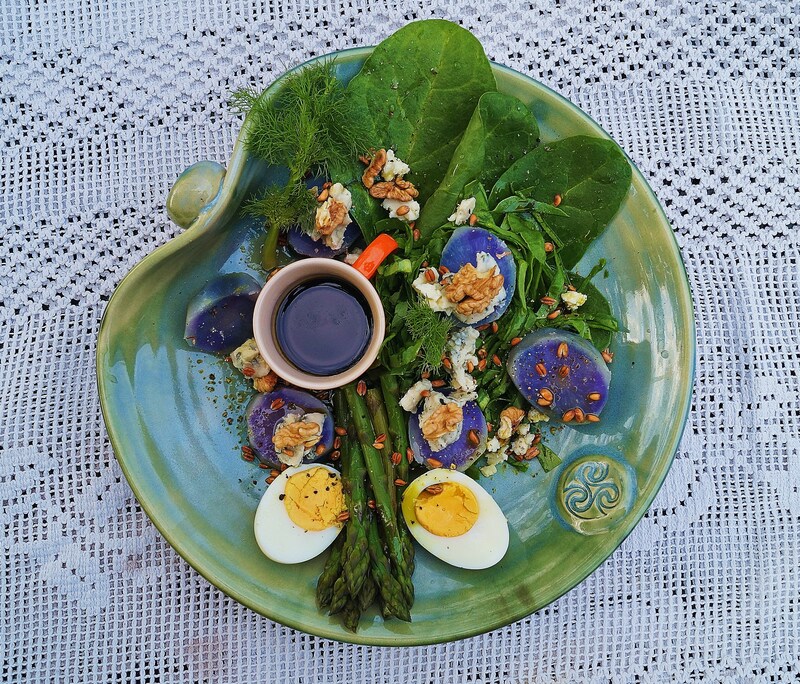 It is rich in Anthocyanin too, that pigment found in a lot of fruits and vegetables, even flowers. Very rich in antioxidant, this is where I am going to leave science. It makes a cool contrast… End of! I peeled and cut the potatoes in halves, and boiled them gently in salted water. There is no real time to give as advice, just stay around and don’t boil them to hard. Once the tip of a knife seem to go through firmly but without forcing it, drain and cool straight away. I also got a beautiful bunch of green asparagus, in season at the moment. I bring to the boil a pot of salted water ( salt will keep the green, remember that) and before you throw them in the boiling water, cut them in half; the bottom stalks can be a bit hard. It will take about five minutes. 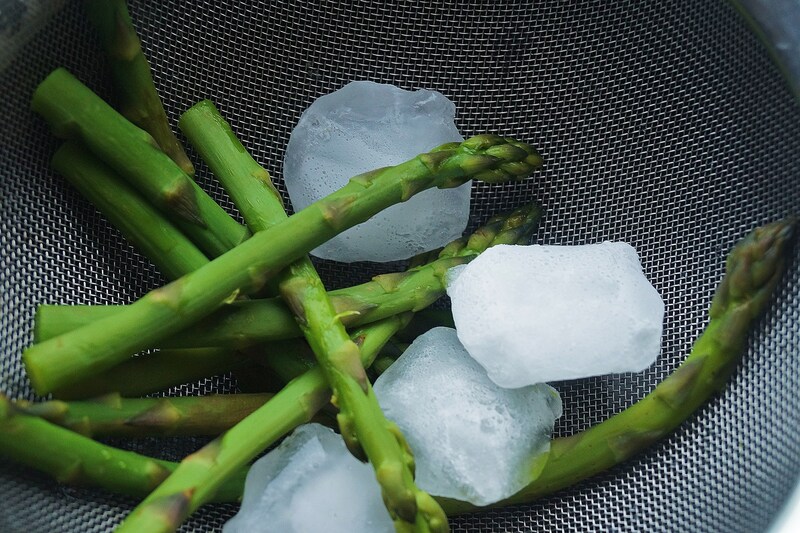 Before you cool them with a bit of water, throw in some ice cubes on top. 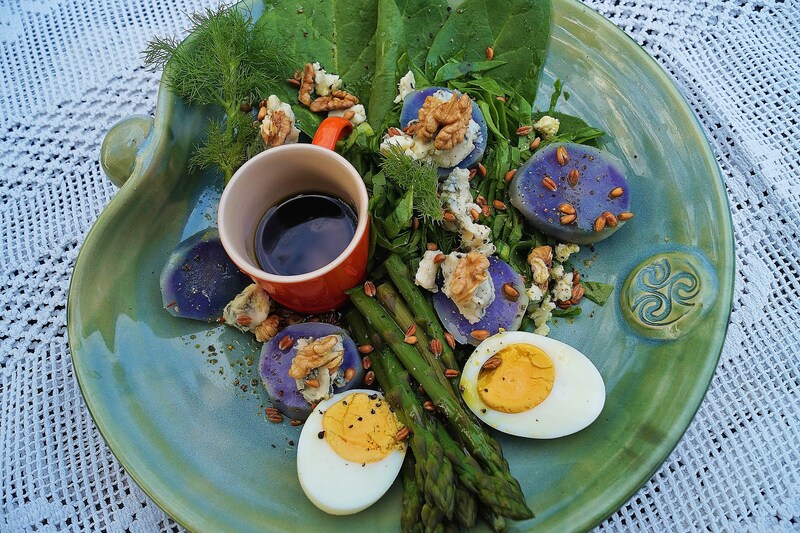 Asparagus tend to take the taste of the water… An old trick! For the base, I thinly chopped some fresh spinach. They are so tender at this time of year! Like I said earlier, I dry roast the spelt berries and the walnuts (about 5 or 6 that I have cracked previously). It will take no time, in a hot pan, with nothing else until it goes a bit brown. 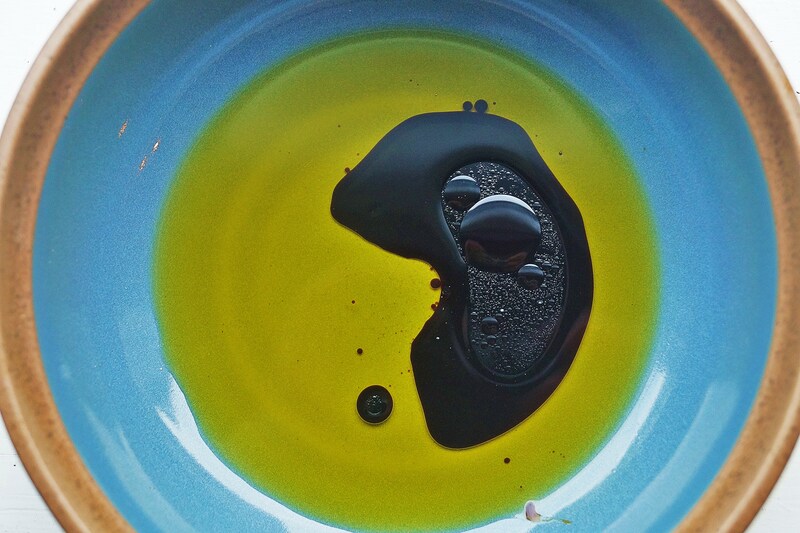 For the dressing, I do the old favourite recipe a Breton chef friend of mind gave me a long time ago; 3 tbsp olive oil, 1 tbsp Balsamic vinegar, 1 tbsp organic soya sauce and a tea spoon of honey… For a bit of drama, I like to serve it in a wee colourful cup or jug… I am insane like that! 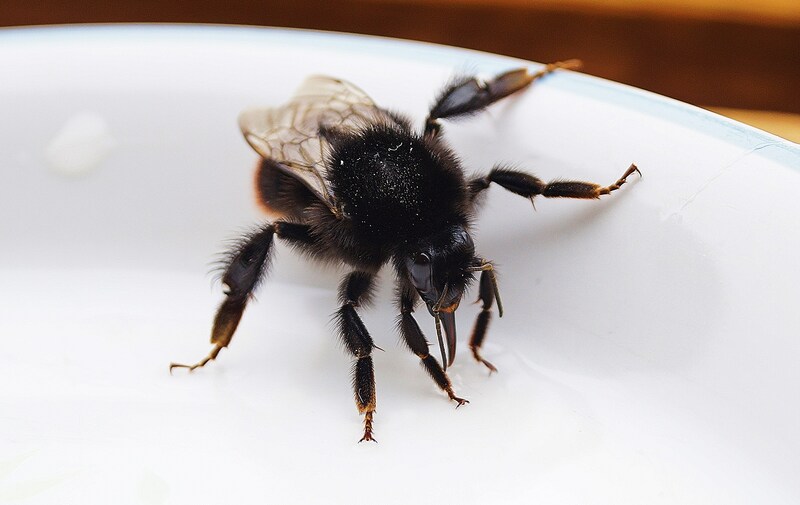 And just in case you were wondering… Yes, I did get up and fed my Red Tailed Bumblebee, with water and honey… They need all the help they can get those days! I don’t know about that, but it makes a nice story 😉 Thank you! The whole ‘berries’ thing was throwing me a bit; I guess they’re seeds really. Not that it spoiled another great post, you understand! My misunderstanding. I was confused too… I’ll go with seeds as well. Maybe they felt that seeds would confuse the cook? 😀 Thank you!